If you close your eyes, or maybe just squint a little, you can see the early rock'n'roll bones that hold up VISSIA'S debut album. It's that strong sense of tradition that gives Place Holder so much rich texture. VISSIA's voice belongs in thousands of bars across the world and across decades. She plays to this strength with great effect, giving Place Holder such a timeless quality that you wonder why you haven't already listened to it. (Spoiler: it only came out this past Friday.) If Kathleen Edwards were a little less sad, or Neko Case a little bit poppier, you'd get VISSIA. Her voice isn't enough, though. VISSIA's lyrics have a cut-to-the-chase quality that should remind you of the great singer-songwriters of the 90s. You get the sense that if VISSIA had been born about ten years earlier, she'd be more than equal to the people she clearly sees as her role models. 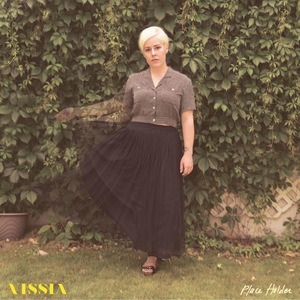 VISSIA's versatility between jazz, country, and 90s bar rock can't be overstated. For me, it's a little slice of everything I love. Thanks for reading! Help me help you find great music! Subscribe to my Patreon or drop a tip in my Ko-fi cup!